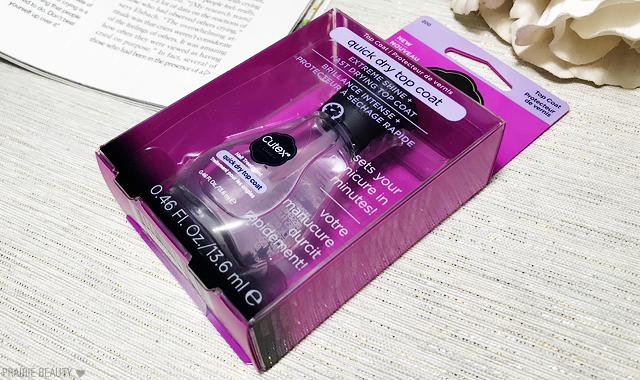 Recently, on the recommendation of a nail junkie who got the recommendation from another nail junkie, I picked up a bottle of the Cutex Quick Dry Top Coat. Finding a good quick dry top coat can be a pain and I'm always up for trying out one that I hear good things about. I decided I wanted to review it here for you guys, and since I already had a couple of other products from the Cutex Care line in my collection, I decided to include those in this review as well. 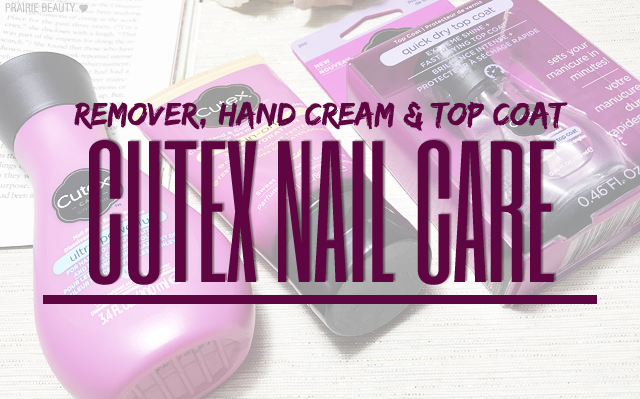 When Cutex launched their new line of products, over a year ago now I think, I wasn't quite as big into doing my nails and taking good care of them as I am now so I didn't ravenously go and pick everything up. I remember the old Cutex, always a staple but never really exciting, so I think it was a phenomenal idea to do a sort of relaunch and bring out a good selection of products. I was pretty impressed with the diversity of what they came out with, though. With multiple different formulas of removers, treatments, creams, tools, and polishes I felt like it was a really comprehensive line even though it didn't seem to have an overwhelming number of products. Getting glitter off my nails is the number one reason that I don't reach for glitter very often at all. Like... almost never. But I want to because... GLITTER. Anyway, I picked this up in hopes that it would help me to remove my glitter polish without the negative side effects of reaching for pure acetone, and it really does. It's really solid at removing glitter polish, doesn't smell like you're going to OD on chemicals, and doesn't leave my cuticles look like they've been without water for a month. I don't actually use this very often since I'm more likely to reach for a traditional remover that has some hydrating claims if possible, so the small bottle is lasting me a while, but whenever I'm wearing hard to remove polish this one comes out to play and I'm definitely going to re-up soon to make sure I have this on hand. Literally anything with Sweet Almond scent is coming home with me. I mean, not absolutely everything, but really anything, if that makes sense. This was actually the first product I picked up from the new Cutex and I'm really happy with it. I tend to use a lot of really intense hand creams that can take a while to sink in, but this one is much more lightweight and soaks into the skin quickly, so it's a great one to keep in my purse for on the go when I can't reasonably have greasy, slippery hands. The almond scent is obviously lovely, though probably not my favorite iteration of almond scented things. Overall, I would say that this is a solid hand cream and would definitely recommend it for someone looking for a hand cream that's effective but more lightweight that a lot of what's out there. I haven't tried out any of the Cutex polishes, but I was really excited when I heard good things about the Quick Dry Top Coat, and it absolutely has not disappointed. I basically have three main criteria when it comes to a quick dry top coat. 1. Has to actually dry quick while maintaining shine. 2. Can't shrink. 3. Can't destroy my nail art. You might think those should be easy to find... but you would be wrong. And I am thrilled to say that so far, this is living up to all three of those needs. It dries quickly and leaves my nails really shiny and somewhat plumped looking, check! I haven't noticed even minimal shrinking once it completely cures, check! And it doesn't smudge my nail art at all that I've noticed, check! As to the last part, I do use a light hand when applying top coat over nail art, particularly over stamping, but I have tested this dragging it right against the nail and I haven't noticed any smudging. So basically I'm in love with this top coat and I'm going to keep buying it constantly. It's my new ride or die. 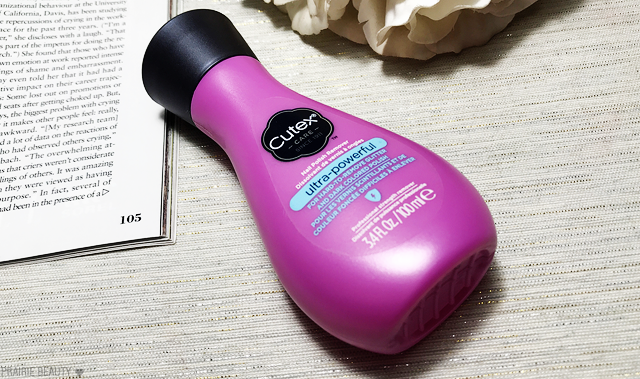 Overall, I'm really impressed with what I've tried out from the Cutex Care line up and I'm looking forward to trying more soon. On my shopping list are definitely the Stained Nail Corrector, the Hydrating Cuticle Oil, a Foot Cream, and probably a polish or two... I mean, you have to get a real feel for the line, right? Self-enabling engage! Anyway, if you're interested in any of these products, I believe I've only seen them in store in a self contained display at my local Rexall. I'm not entirely where else they're available, but if you can find them I definitely recommend trying them out!